In-library use of computers is available at all Library District branches. You may access electronic resources including full-text newspapers, magazines and encyclopedias as well as word processing software. You may also access the Internet. For specific information regarding Internet access, please view the Library’s Internet and Wireless Use Policy. The Library District has dedicated Computer Centers located at the Centennial Hills, Clark County, Las Vegas, Sahara West, Spring Valley, West Las Vegas, and Windmill Libraries where customers can use word processing, spreadsheet and desktop publishing programs, as well as access the Internet. At these locations, staff is available to offer limited assistance and classes are offered on a regular basis to provide more in-depth assistance. 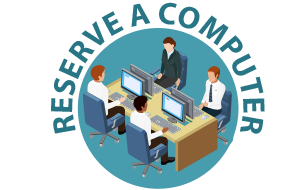 Due to high demand of computer workstations, reservations are recommended. Click here to reserve a computer. Click here to add money for printing. M-Th, 10 a.m. - 7:45 p.m. F-Sun, 10 a.m. - 5:45 p.m.